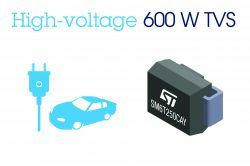 The SM6T250CAY Transil series has been designed to protect sensitive automotive circuits against surges defined in ISO 7637-2 and against electrostatic discharges according to IEC 61000-4-2 and ISO 10605. The planar technology makes this device compatible with high-end circuits where low leakage current and high junction temperature are required to provide reliability and stability over time. SM6T250CAY is packaged in SMB (SMB footprint in accordance with IPC 7531 standard).